Just back home from the drinks reception that followed today’s Winter Graduation Ceremony at the University of Sussex at the Dome, in Brighton. And a very nice event it was too! 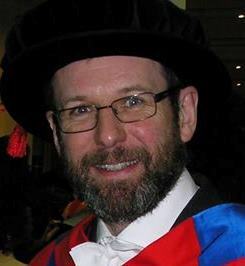 The Winter Graduation ceremony is primarily taken up with postgraduate degrees, and within School of Mathematical and Physical Sciences the largest proportion of those are in Mathematics, especially in the MSc courses in Financial Mathematics and Corporate and Financial Risk Management on which we have a large number of overseas students, e.g. From China. My first graduation ceremony as Head of School therefore presented me with some pronunciation challenges as I read out the names of the graduands. I was a bit nervous beforehand, not because I’m afraid of making a fool of myself but because these days everything is captured on video for posterity and I didn’t want to ruin anyone’s record of their Big Day. I practised quite a lot actually, and think it was OK. I am always impressed at students who have the courage to travel halfway around the world to study in a foreign land. Graduation is a rite of passage for all students, but it must be of even greater significance for students from abroad. I’ve attended graduation ceremonies at a number of other universities, and the big difference with Sussex is how much less formal it is. A great deal of credit for that must go to the Chancellor, the brilliantly funny and approachable Sanjeev Bhaskar, who ran the show in inimitable style. He also has a lovely head of hair. Sanjeev always had a word with the graduands as they crossed the stage, often a hug, and very allowed them to take a selfie, once sitting in the Chancellor’s chair! I found it all very amusing, which helped me relax before my turn at the podium with the list of names. I’ve sat through a large number of dull and stuffy graduation ceremonies in my time, and much prefer the Sussex style! 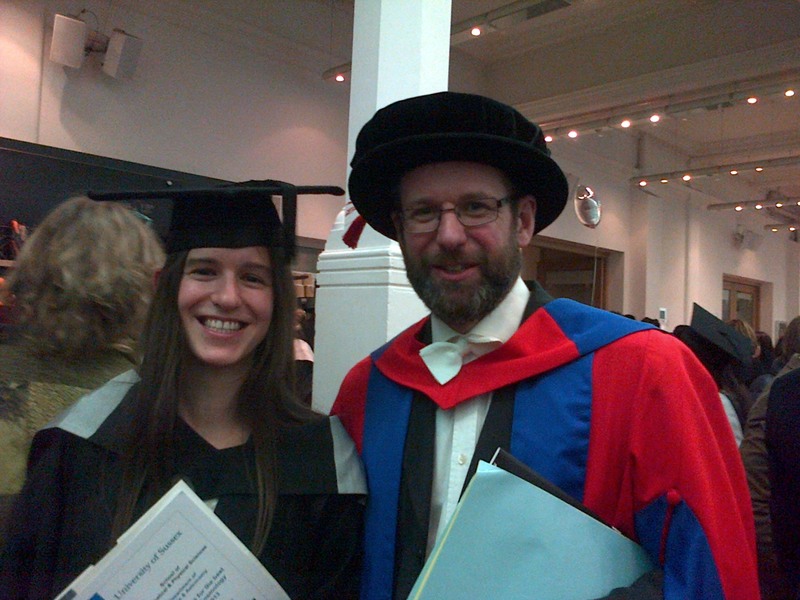 Also graduating with top marks in our MSc in Cosmology was Mateja Gosenca, who is now my PhD student. 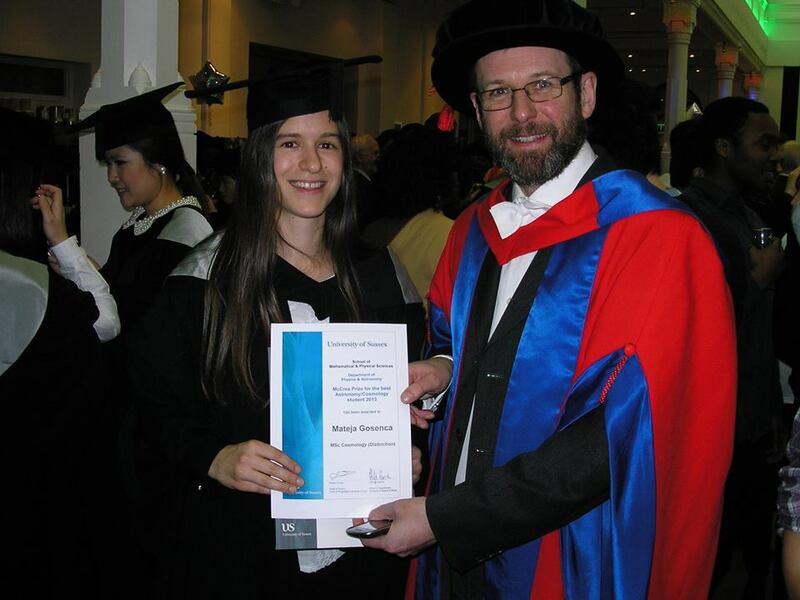 Here we are at the drinks party after the graduation ceremony; Mateja is looking very happy holding her certificate as winner of the Sir William McCrea Prize for the best student on the MSc programme!